Berg Adventures 2009 Ecuador team will land in Quito and prepare to climb the glaciers of the highest volcanoes in the Central Andes. Starting off with Ecuador’s third highest summit, Cayambe 5,790m/18,900ft. 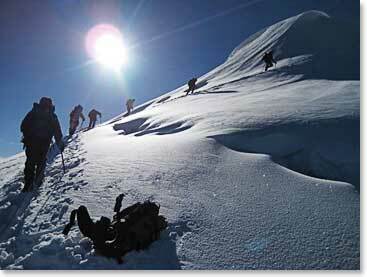 They will review basic mountaineering skills and have their first acclimatization climb. Second is Cotopaxi, 5,900m/19,350ft. The symmetry of this beautiful glaciated volcano is world famous and it is the second highest in Ecuador. Last but not least is the summit of Chimborazo, 6310m/20,701ft. It is the farthest point from the Earth`s centre due to the equatorial bulge (or diameter at the equator) 2.1 km farther than the summit of Everest! Follow this team daily as they report from this South American volcanic land! November 17, 2009 – 100% Success on Cotopaxi! November 15, 2009 – Well Deserved Rest Day! November 13, 2009 – Cayambe Summit! November 10, 2009 – We Climb Our First Volcano in Perfect Weather! November 8, 2009 – Our Adventures in Ecuador Are Underway!